The mighty offshore wind energy beast of the USA is finally beginning to stir, just in time to celebrate American Wind Week. Never heard of American Wind Week? Join the club! It’s annual celebration of all things wind hosted by the American Wind Energy Association, falling on August 5-11 this year. All things being equal, one would expect the Trump* Administration to ignore the festivities, right? Well, kind of right. The White House has been notably silent on the topic of American Wind Week so far, but the US Department of Energy has been filling in the gaps with some vigorous shout-outs. For those of you new to the topic, the US is a bit late to the offshore wind energy party. Scotland and other nations already have “steel in the water,” but so far in the US only tiny Rhode Island (which is not an island) can claim to have a commercial wind farm off its coast. The Obama Administration took some important steps to tap into the rich offshore wind resources of the US, but political issues bogged the effort down along the Atlantic coast, and technology challenges need to be resolved for wind development along the Pacific coast. Somewhat ironically, those renewable energy plans are coming to fruition in a big way under the Trump administration. 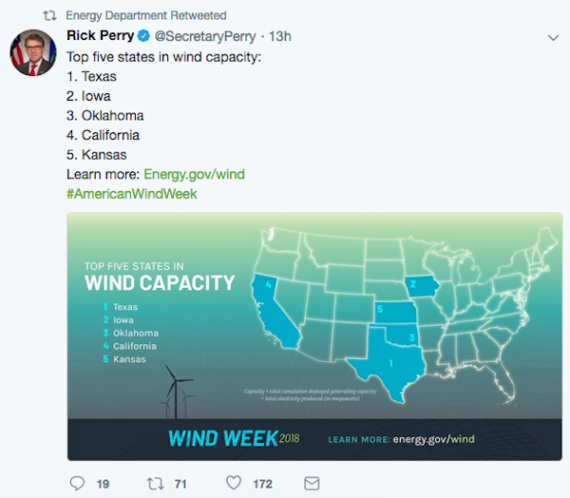 The Department of Energy has continued to promote US wind energy with all pistons firing under Secretary Rick Perry, and even Interior Secretary Ryan Zinke has joined in the cheerleading (Zinke seems to have picked up on Perry’s renewable energy “balancing act” btw — if you have any thoughts on that, drop us a note in the comment thread). The Energy Department has been making some big moves on offshore wind energy in 2018. Chief among them is a new $18.5 million R&D consortium aimed at connecting offshore wind researchers and industry stakeholders, and building up the nation’s wind energy supply chain. New York State lobbied hard to win hosting rights to the project, and it won. Last June the Energy Department tapped NYSERDA (the New York State Energy Research and Development Authority) to lead the new Offshore Wind Research and Development Consortium. CleanTechnica spoke to NYSERDA earlier this summer and…we lost our notes! We’ll find them eventually but meanwhile, the gist of the conversation was that NYSERDA is fully prepared to manage a bi-coastal effort that addresses the distinct technology and environmental challenges for both Atlantic and Pacific development. Charity starts at home: New York Governor Andrew Cuomo is already eyeballing a wealth of opportunity for developing offshore wind in the New York Bight, as mapped out by the Department of the Interior (a bight is a “corner” in a coastline, in this case formed by New York’s Long Island jutting out over New Jersey). In support of the Administration’s priorities to advance domestic energy production, generate revenue, and increase job opportunities nationwide, BOEM is moving forward with wind energy planning efforts on the Outer Continental Shelf (OCS) in the New York Bight region, which represents an area of shallow waters between Long Island (to the north and east) and the New Jersey coast (to the south and west). That finally brings us around to American Wind Week. This is actually just the second annual AWW so it’s easy to get why a lot of people don’t even know it’s happening. However, the US Department of Energy sure noticed. In the runup to AWW, last Friday the agency announced a big new initiative to ramp up the nation’s offshore wind energy test facilities. DOE also deployed its @ENERGY Twitter account to acknowledge this special week with the hashtag #AmericanWindWeek, taking note of the top five wind producing states: 1. Texas 2. Iowa 3. Oklahoma 4. California 5. Kansas. Oh wait, we thought that was realness, not realism. Whatever. Winning! American Wind Week is just getting started so stay tuned. *Image: US Department of Energy via Twitter.